Driver was shot several times during an early morning police raid in his home on Sept. 14 on Detroit's west side that was carried out in connection with the shooting death in Detroit the night before of a 5-year-old girl, Isabella Coleman, and nonfatal shooting of her mom. Driver was not the person police were initially searching for, but was armed while on a couch, Detroit Police Chief James Craig said at a recent meeting of the Detroit Police Board of Commissioners. Some advocates in the Muslim community have raised concerns about the shooting of Driver, also known by his Muslim name, Abdullah Abdul Muhaimin, or Abdullah Beard. A Muslim leader whose congregation Driver was a part of was killed by the FBI in 2009 in Dearborn. The national and Michigan offices of the Council on American-Islamic Relations (CAIR), a Muslim-American civil rights group, is representing the family of Driver, said Dawud Walid, executive director of Michigan CAIR. Driver's family and friends are in shock, said his friend, Jermaine Carey. "It hurt so bad," Carey told the Free Press. "A lot of people right now are extremely hurt. A lot of sadness going on right now because his character was so high." While Detroit Police continue to investigate the girl's shooting, the Michigan State Police Third District's Special Investigative Section is investigating the shooting of Driver, said First Lt. Michael Shaw, a spokesman for Michigan State police. "Some of the criticism was we went to the wrong house, we got the wrong suspect," said Chief Craig at a meeting of the Detroit Police Board of Commissioners on Sept. 20. "In fact, while this person that we ended up using deadly force on was not identified as part of this investigation ... I can not conclusively say that he's not involved in it, because that investigation is still ongoing." At a news conference on Sept. 14, Craig was asked by a reporter about the shooting of Driver: "Did you have the wrong guy?" Craig replied: "Well, when an individual is armed with this weapon and this weapon is pointed in the direction of the police officer, clearly that officer, in his mind, believes he's faced with an imminent threat. And so whether he's the suspect involved in the shooting the night prior, he is now a suspect in felonious assault against a Detroit police officer." The FBI's shooting had drawn criticism from civil rights advocates for its use of undercover informants targeting Muslims while authorities said their investigation and shooting was justified. Driver was among several followers of Abdullah arrested during the 2009 raids in Dearborn and Detroit by federal agents. 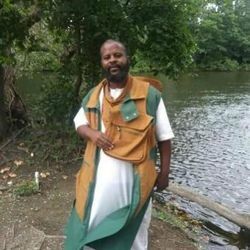 The FBI had said Driver was part of the armed security team at Abdullah's mosque and talked with an undercover informant about potential crimes.The FBI said another member of Abdullah's mosque, Ismael Abdul Malik, had shot two Detroit police officers in February 2006, which sparked their investigation into Abdullah. In 2011, Driver pleaded guilty to conspiracy to commit federal crimes for dealing with stolen goods. The FBI portrayed Abdullah and his followers as radical Muslims, claims they strongly denied. They later filed a lawsuit against the FBI , saying the FBI "engaged in a concerted effort to manipulate and conceal the evidence concerning the brutal death of Abdullah." Driver was married just a few months ago and was taking truck driving lessons, said his friends. He had been given the nickname "Beard" because of his big beard. Muslim advocates have rallied to support Driver, starting a fundraising effort for his family on LaunchGood, an online site similar to GoFundMe created by Muslim-Americans in Michigan. On Twitter, they expressed support for him with the hashtag #JusticeforDullahBeard. According to Chief Craig, here's how the shooting of Driver happened. After police responded to the shooting of Coleman, 5, and her mother, Dejiza Coleman, "we got a vehicle description of a vehicle that left scene of this homicide of the 5-year-old," Craig said to the Detroit Police Board of Commissioners. "We followed that evidence and it took us to the location where we got a search warrant signed by a judge. We also had information on a suspect who would be at that location. We executed that search warrant. We were at the right location. We recovered the vehicle. We did arrest the person of interest that we were looking for at that location." Craig said police with an SRT (Special Response Team) "announced their presence" outside the home of Driver on the 9200 block of Evergreen Road. "before deploying a distraction device," a flash-bang grenade. Craig said at the commissioners meeting that "the person that we were looking for was at that location and was detained and arrested and released." Another person was also detained and later released. "There was not enough to charge either suspect, but that does not mean that at some point they will not be charged," Craig said. "So that investigation continues." Craig said the video evidence shows "this suspect prior to the shooting was in fact holding the gun. I saw it. My team has saw it."